Lighting accounts for 10 percent of an average household’s energy consumption—a major use of energy and a big expense. But, if you look on the bright side, there’s also a big potential for savings—a win for your wallet and the environment. Most people know they can save money and protect air quality by simply turning off lights when they’re not in use. But you can do even more by switching to energy-efficient bulbs. This is one of the fastest ways to cut your energy bills. There are several options in energy-efficient lighting. In this article, we’ll help you decide between two popular choices, LED and CFL bulbs. What’s Unique About LED Bulbs? 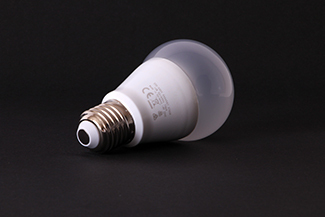 LED (light-emitting diode) bulbs are some of the most energy-efficient lights on the market. Quality LED bulbs last longer, are more durable, and offer comparable or better light quality than other types of lighting. In general, LEDs are more energy-efficient, more versatile, and last longer than other types of bulbs, including CFLs. Residential LEDs, especially ENERGY STAR-rated products, use at least 75 percent less energy—even up to 90 percent less—and last 25 times longer than incandescent lighting. LED bulbs emit very little heat. LEDs typically do not burn out. Instead, they gradually dim over time until they reach the end of their useful life—when light output has decreased by 30 percent. Unlike incandescent and CFL bulbs, which emit light in all directions, LEDs emit light in a specific direction. If you want a uniform glow, select an LED bulb that has been engineered to produce a light that shines in every direction—or choose a CFL. What’s Different About CFL Bulbs? CFL stands for compact fluorescent lamp. These bulbs come in a variety of styles and shapes and, like all fluorescent lamps, contain a tiny amount of mercury which is needed to make them work properly and efficiently. 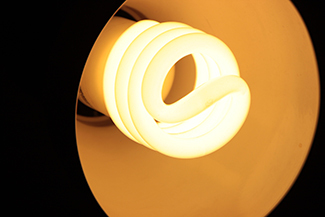 CFLs use 75 percent less energy than a traditional incandescent bulb and last anywhere from six to 15 times longer. These bulbs release about 80 percent of their energy as heat. CFLs need a little more energy when they are first turned on. Therefore, they are most suitable in areas where lights are on for long periods of time; they are not as efficient in areas where lights are turned on for short periods of time, such as in closets or pantries. The amount of mercury in CFL bulbs is small; however, heavy metals can be hazardous to the environment. It’s important to recycle CFLs rather than throw them away, and you should take care when cleaning up a broken CFL. These bulbs are sensitive to extreme temperatures and, when used indoors, operate best in open fixtures. 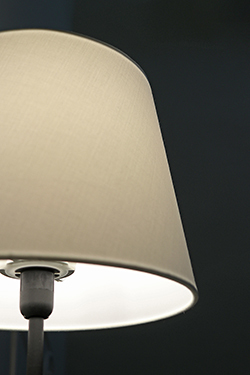 Enclosed fixtures can create a hot environment that reduces the lifetime of your bulbs. There are a wide variety of readily-available options in CFLs and LEDs, and both come in a variety of colors and hues to match the mood of your space and your lighting needs. CFLs and LEDs are both ideal for hard-to-reach locations, although LEDs may be slightly better since they typically last longer. Both options have a higher up-front cost than incandescent bulbs, but will save you money over their lifetime because they use less energy. For one year, the cost to operate an incandescent bulb is $4.80. Compare that to $1.00 for LEDs and $1.20 for CFLs and you can see how quickly your savings will add up. What Should I Do With a Broken CFL?